In rural Nevada County California Sierra Harvest works in local schools to educate, inspire and connect local families to fresh, local, seasonal food. As a Nevada County native, I am excited about this important work in the schools I grew up in. In celebration of National Farm to School Week and National Food Day, Sierra Harvest organized Tasting Week in 12 Nevada County schools. Building on Sierra Harvest's Farm to School program in which each school is partnered with a local farm, I supported Rachelle Zorne, an amazing organizer and dedicated Sierra Harvest volunteer, in connecting each school with a local chef to engage students in a tasting of local, fresh, seasonal food. Ingredients were purchased from the school's farm partner as much as possible. Each guest chef donated their time to cook up farm-fresh produce, creating an opportunity for students to experience new flavors and learn how to make healthy eating choices. From winter greens, to beet kvas, to nutmilks, students all over the county experienced something new. Some students were licking their plates, while others asked for the recipe to share with their parents. My farming and cooking background came in handy at Ready Springs, a K-8 school (that I attended from Kindergarden through second grade) with a free and reduced lunch rate of nearly 74%. Kindergarten and first graders became excited to eat the “brother/sister” plant of broccoli in a Kale Salad, garnished with soaked sunflower seeds. A seventh grader said, “Wow! This looks delicious, I can't wait to try it!” One kindergartner actually broke into tears when his teacher told him he couldn't save his salad to share with his mom after school—poor guy. 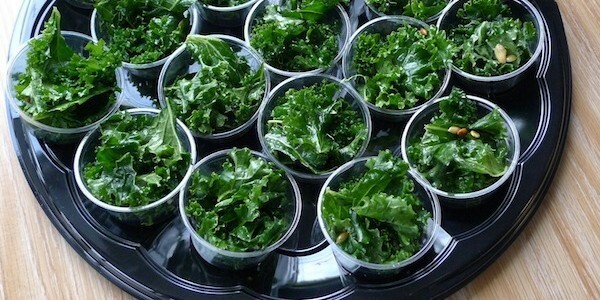 Of the four classes that participated in the tasting, about ¾ of each class raised their hand when I asked how many of them liked the salad, the same proportion of the class that had never tried kale before. When I asked students if they would like a recipe to take home to their parents, nearly all of them wanted the recipe. In addition to talking about kale and its relationship to broccoli, we also talked about how seeds use the digestive systems of animals to carry them to a new place, and how soaking and grinding seeds allow us to access the nutrients in seeds, otherwise prepared for the parent plant's young. 1/4 cup sunflower seeds soaked in sea salt water overnight (the salt water should taste as salty as the water of the ocean)--feel free to substitute walnuts or almonds soaked in the same manner, or if you have pine trees, try harvesting and roasting your own pine nuts. Elizabeth Lane currently serves as a FoodCorps service member in her home town community. FoodCorps is a nationwide team of leaders that connects kids to real food and helps them grow up healthy. This happens through a network of local partner organizations that host FoodCorps service members in limited-resource communities for one year. Service members teach kids about what healthy food is and where it comes from, build and tend school gardens, and bring high-quality local food into public school cafeterias.